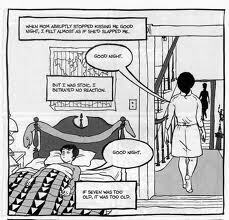 Another one of the texts that will be making an appearance in my exam in a few weeks alongside The God of Small Things, Lunch Poems and various others is Alison Bechdel’s Fun Home, a graphic novel. Surprisingly, I loved this book. I honestly cannot express how much I enjoyed reading it contrary to my expectations. Having never read a graphic novel before I didn’t know what to expect from it. I was unsure if the combination of images and writing would work effectively enough to portray the important issues that Bechdel was writing about. But I could not have been more wrong. Not only did the form make the text simple and elegant to read but the images helped exaggerate what Alison was talking about in the text. My favourite example of this was at the end of the first chapter when Alison commented that the obelisk her father wanted instead of a headstone was ironic as it was a similar shape to a shape he enjoyed in real life…then just to make sure that all the readers picked up on the joke, the next page was dedicated to a single of image of a large obelisk, looking particularly phallic. Bechdel writes about pretty heavy-handed material. Death (or potential suicide), homosexuality, coming-out, growing up, a dysfunctional family. None of the subject matter is easy on the emotion. Yet expressing them through the medium of a graphic novel makes them more accessible and reader friendly. The non-linear narrative means that we know her father is dead and that there were questionable circumstances around it, but we don’t know the full picture until the very end of the novel. Alison herself doesn’t seem to understand her father’s life until she has mapped it out for the reader, almost as if the text is her stream of consciousness. After his death she looks back and seems to evaluate her and her father’s lives, to try and notice if there were signs. Indications of what would follow. At the time she didn’t notice that her father would stare at the choir boys while they were in church. She didn’t notice that he had an overly friendly relationship with their gardener and babysitter. She also didn’t notice that her father wanted her to look pretty and dress up while all she wanted to do was wear boys clothes. I like this type of narrative. The kind that doesn’t make sense at the beginning, but it is interesting enough to draw you in and make you read on. Similar to The God of Small Things, it doesn’t make sense until you turn over the final page. The eyes give everything away. Perhaps I enjoyed this book more because it was my first graphic novel. In fact, although a thick book you could easily read it within a couple of hours because there is barely any text. After re-reading it I also discovered many other pieces of information, symbols and motifs that appear throughout which are not necessarily apparent the first time round. You may not even pay attention to the images whilst reading, or just look at the pictures and ignore the text. In fact, by doing either you would still understand the plot of the text. Which is what just makes the book so fantastically clever. This could just be the medium acting here, and I being a graphic novel virgin I am unable to compare. However after enjoying this so much I went ahead and ordered Bechdel’s follow up graphic novel Are you my mother? which I will be reading as soon as the exam season is over. Then perhaps I will be able to offer a less subjective opinion.